A quick video of a two-spot octopus I found. Click on the video and then press play on flickr. 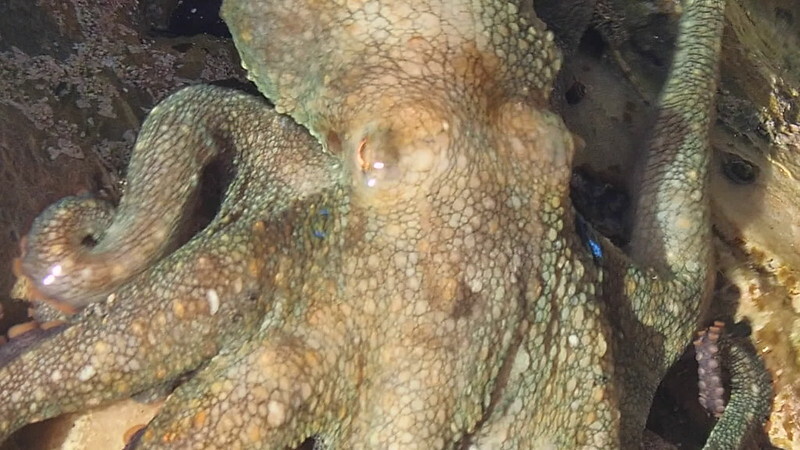 That's the coolest footage I'm seen of an octopus Awesome colors and clarity. I like how you can hear the waves in the background as well. Leaving the audio in was a good choice I gotta try tide pooling sometime. When the best time of year and condition to look for something like this? I figure after a storm and low tide, but is there a breeding season or certain month to look for them? Thanks porter, so far I haven't seen any seasonal patterns (I just started in the summer). Obviously you need to plan your visit at low tide. I look under rocks at the low tide line and usually that works pretty well. The audio is actually just from imovie lol. Other wise there would have been a bunch of talking.